Primary Inspired: Lunchbox Linky Party! What a fun idea for a linky party! 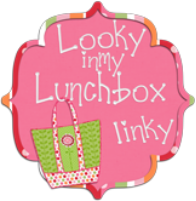 Tara over at 4th Grade Frolics is having a Lunchbox Linky party.....what a great idea! Here's my lunchbox. It was my first piece of Thirty-One. My daughter now sells thirty-one, so I've acquired a number of pieces. I think it's about time for a new lunch tote, too. Have you seen the new cinch-up thermal totes? SO cute! I'm currently on a quest to lose some pounds (doing Weight Watchers), so my lunches aren't too exciting. They're healthy....but not too exciting. As you can tell, I take tons of fruits & vegetables. I over-pack so that I can have some fruit or veggies after school. ( I am STARVING by the end of the day!). In addition to the fruits & veggies, I also take planned leftovers. Today was taco salad (minus the chips so there are fewer points). We eat a little early....11:05. At my school, the kiddos go to recess before lunch. We've found they eat better after they've been outside burning off some steam. We used to do lunch first & recess after, but found that once the first finishers were done, all the others stopped eating & tossed their trays finished quickly and headed out to play. I either have recess or lunch duty nearly every day. My grade level teamies & I rotate. We each have 1-2 duty-free days per week. Regardless of which duty we have, we all get 30 minutes "uninterrupted".Of course, you all know once we walk the kids down & go back to pick up, etc....it's really more like 20 minutes. Once or twice a week, I invite some kiddos to eat lunch in the classroom...."Lunch Bunch". I use it as a reward & it's one of my kiddos favorite treats. I think it's fun eating in the room too! That is a great idea to have recess first! We have the same problem - a few kids finish lunch and then everybody is done. And our lunch supervisors won't keep the kids in the lunch room when they're done... they let them go outside right away so it is just reinforcing it! Our school has been trying to implement recess first as well. We just can't seem to get the logistics down, but it seems like such a great way to get them to eat more and not waste so much!! Your lunch bag is adorable!! I need to check out the new 31 bags. Found you through Tara's Lunchbox Linky! Can't wait to stalk you.